Is Google Motors the new GM? While the revelation was tantalizing, it did little to illuminate the company's intentions. Or, to put it more bluntly, what is Google up to? Are its enormously capable engineers off on some job-enrichment lark, like the engineers at Honda (HMC) developing the humanoid robot Asimo? Or does Google plan to extend its digital mastery into the automotive industry as a supplier, partner, or original equipment manufacturer? When asked to clarify the company's intentions about the car business, a Google spokesman was, not surprisingly, opaque. "As it stands, the focus of the team is truly on the research aspects of the project," he said. "I anticipate that there may be an opportunity to discuss any future conversations or cooperation with the auto industry down the road sometime, but it would be premature to have those kinds of conversations today." 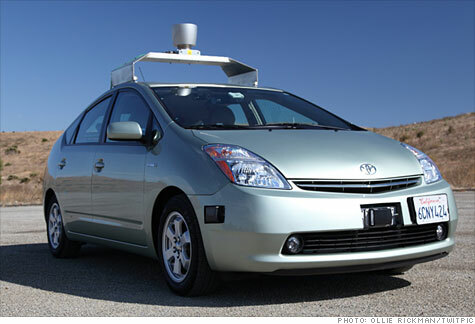 Could Google Motors become the next GM (GM, Fortune 500)? It's more likely than you'd think. The lumbering, Luddite world of automobiles has a special attraction for Silicon Valley entrepreneurs. Back during the last Internet bubble, Sky Dayton, founder of Earthlink, took some exploratory steps toward forming a virtual, build-to-order car manufacturer he called Flint Inc. More recently, and more successfully, Elon Musk invested some of the millions he made from starting PayPal in Tesla Motors, a maker of battery-powered cars. By investigating driverless cars, Google is exploring an area that has tantalized automotive engineers for decades. Even a devoted driving enthusiast like former General Motors vice chairman Bob Lutz concedes that driverless cars are the way of the future. Autonomous cars would reduce highway congestion, cut down on accidents, maximize fuel economy, and free up time for drivers to perform other tasks. Worries about liability in the case of accidents are likely overblown; adaptive cruise control that automatically applies the brakes when it senses a collision has been used successfully for several years. Driverless cars have been the subject of popular imagination for decades. A driverless electric car, powered by circuits embedded in the roadway and controlled by radio, was the dominant feature of the General Motors Futurama exhibit at the 1939 World's Fair in New York City. The Defense Advanced Research Projects Agency (DARPA) has been supporting research into autonomous vehicles since the 1980s and sponsors a driverless vehicle competition, called the DARPA Grand Challenge. Smaller scale experiments have been going on for some time. A fleet of driverless Buicks, partially sponsored by California state agencies, navigated a seven mile stretch of automated highway near San Diego in 1997, guided by magnets embedded in the roadway. Autos would seem to be an unnecessary diversion for Google, which has its hands full with debates over copyright law enforcement, rogue drug ads, and censorship in China. But as its focus on its Android operating system makes clear, having largely exploited its position in online search, it is looking for new worlds to conquer. With 15 million new cars sold in the U.S. every year, and 60 million worldwide, the potential market for driverless cars is huge. As Google explains it, its automated cars use video cameras, radar sensors and a laser range finder to "see" other traffic and detailed maps to navigate the road ahead. The Google advantage comes from its data centers, which can process enormous amounts of information gathered by its cars when mapping their terrain. Google modestly believes it may have achieved "a first in robotics research," but if the claims it makes are true, it has achieved a once-in-a-generation breakthrough. Its automated cars have driven from Mountain View in northern California to Santa Monica and Hollywood Boulevard in southern California, crossed the Golden Gate Bridge, navigated the Pacific Coast Highway, and circumnavigated Lake Tahoe. In all, its fleet of seven self-driving cars has covered over 140,000 miles -- presumably without incident. Assuming it can develop a commercially viable product, what is Google's future in the auto industry? Probably not as a vehicle manufacturer. Too much capital is required for too little return. Probably not as a parts supplier. Google has made its billions selling ideas, not making things. Probably not in partnership with a full-line manufacturer. Why should Google limit itself to one customer? As the exclusive supplier of proprietary software? Bingo! Google's automated driver system has the potential to become the operating standard for every car in the world -- the Windows of motor vehicles. Why not? Google has the capability, the ambition, and the resources. With $36 billion in cash in the bank at last count, and more piling up every day, it is hard to imagine a better investment -- both for Google and the future of personal transportation. As Google's chief researcher on the project, Sebastian Thrun, put it, "Larry and Sergey founded Google because they wanted to help solve really big problems using technology. And one of the big problems we're working on today is car safety and efficiency. Our goal is to help prevent traffic accidents, free up people's time and reduce carbon emissions by fundamentally changing car use." Henry Ford, move over for Larry and Sergey.